One of the few photographs we have of Reverend Griffin. He recently celebrated his 90th birthday. On this 45th anniversary of the assassination of Rev. Dr. Martin Luther King, Jr., it is important to remember that there were many others who fought, and who continue to fight, at a local or regional level for African American civil liberties. One such warrior from the central Texas region was Rev. Dr. Marvin Griffin. 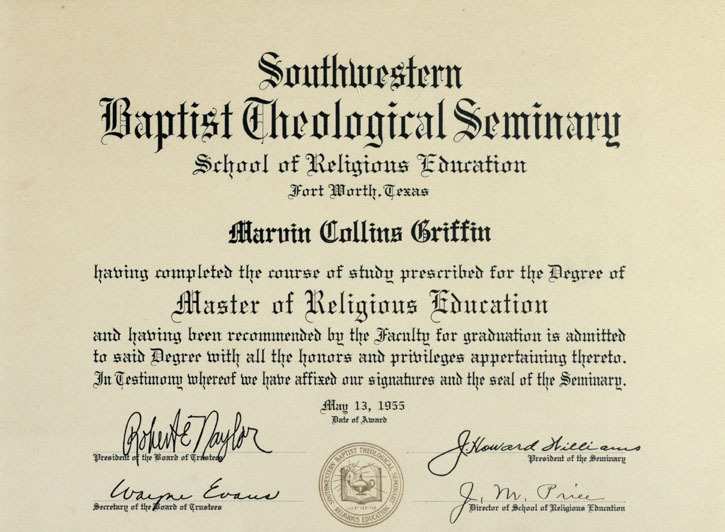 In 1955, Marvin Griffin became the first African American to graduate with a degree from Southwestern Baptist Theological Seminary in Fort Worth. He earned a master’s degree in religious education. Marvin Collins Griffin was born in Wichita, Kansas, on February 20, 1923, and felt a call to ministry at the young age of seven. Education proved to be a powerful medium through which Griffin could equip himself to preach the gospel and fight for African American civil rights. Griffin earned his bachelor of arts from Bishop College in 1943, a divinity degree from Oberlin Graduate School of Theology in 1947, and a master’s degree in religious education from Southwestern Baptist Theological Seminary in 1955. That last degree was particularly noteworthy, because Griffin was the first African American to earn a degree from SBTS. Years later, Griffin would go on to attain a Doctorate of Ministry degree from Austin Presbyterian Theological Seminary. 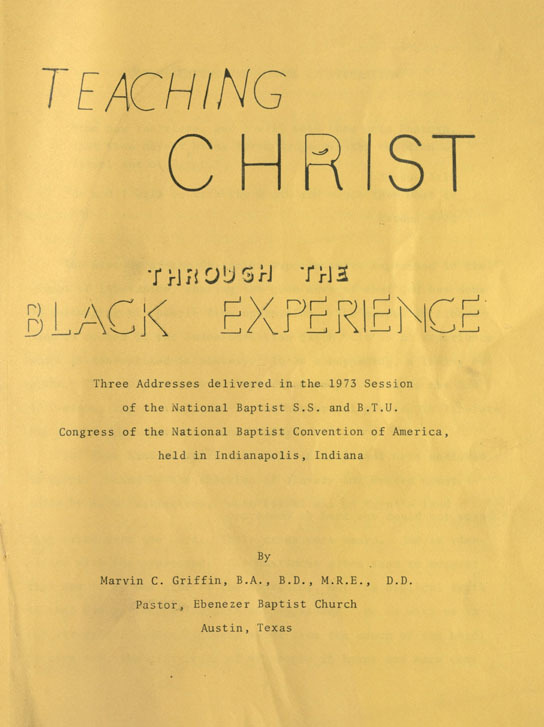 In 1973, in front of the National Baptist Sunday School and Baptist Training Union Congress, Marvin Griffin presented a series of addresses entitled “Teaching Christ Through the Black Experience.” As is the case with Martin Luther King, Jr., it is impossible to separate Marvin Griffin’s experiences as a civil rights activist from his Christian beliefs. Griffin used his quality education and his sense of calling to fuel his ministries. His first significant pastoral assignment was at New Hope Baptist Church in Waco. From 1951 to 1969, Griffin led his congregation in Christian and social activism. He began an extensive radio broadcast ministry and led various marches and pickets in Waco. The Marvin C. Griffin papers at The Texas Collection feature more than 1,500 audio recordings of his sermons and broadcasts, starting in the 1960s and continuing into the 2010s. In 1969, Griffin relocated to Ebenezer Baptist Church in Austin, Texas where he remained for the next 42 years. Once again, Griffin believed that his church should be involved in the spiritual and secular life of the community. He led the church’s efforts in creating the East Austin Economic Development Corporation in 1998. This organization was a vehicle through which the church could assist the underprivileged through housing programs, day care centers, counseling, and financial assistance. In 2002, the EAEDC building was renamed in honor of Marvin Griffin. 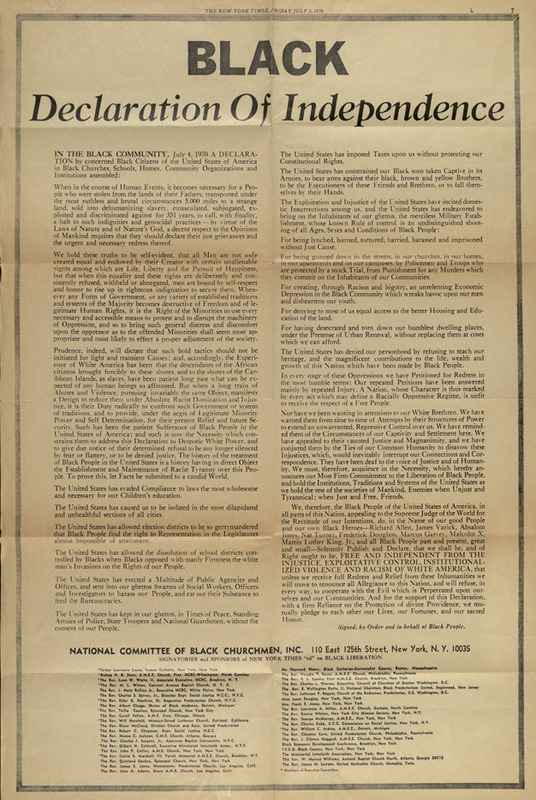 On July 3, 1970, The New York Times printed this document entitled the “Black Declaration of Independence.” Modeled after the Declaration of 1776, this article claimed the same liberties that the Founding Fathers had and then proceeded to denounce some of the ways in which the United States government and society had violated those rights. In addition to his pastoral duties, Griffin was also involved in local politics and denominational affairs. He served as the first African American president of the Austin Independent School District Board of Directors, during which time the schools were using buses to encourage efforts of desegregation. 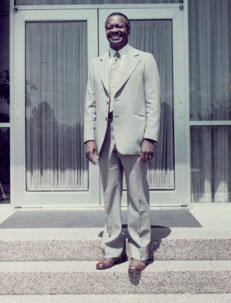 Griffin was also involved in the Missionary Baptist General Convention of Texas, was the Director of the Christian Education Enrichment Program at the National Baptist Fellowship of Churches, and served as a Director-Lecturer for the Teacher Training Department of the National Baptist Sunday School Congress. 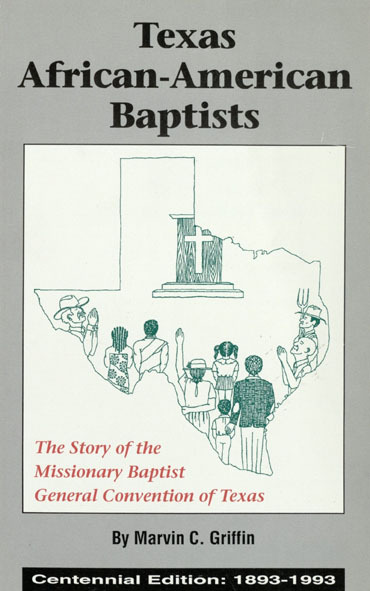 In 1994, Marvin Griffin wrote this book entitled Texas African-American Baptists: The Story of the Missionary Baptist General Convention. On July 31, 2011, Reverend Griffin retired from his tenure as pastor of the Ebenezer Baptist Church. Like Martin Luther King, Griffin devoted his life to preaching the gospel and empowering his peers to rise above the injustice of racial discrimination. The Marvin C. Griffin papers, which have recently been processed, are now open for research. The materials therein provide an in-depth glimpse of Rev. Griffin’s pastoral ministries, his involvement within the Baptist denomination, race relations in the church and in central Texas, as well as the development of a liberation theology. This collection represents a treasure trove for researchers. Come on down to The Texas Collection as we celebrate the life’s work of a revolutionary in Texas race relations! Learn more about Griffin’s leadership in Waco race relations in this article from the Waco History Project on his role in beginning the interracial Doris Miller Dialogue Group (DMDG) shortly after Martin Luther King’s assassination.